The Fellowes Saturn 3i 125 Laminator with Pouch Starter Kit features a rapid, one-minute warm-up with InstaHeat Technology. The 12.5" entry width accommodates multiple document sizes. It delivers hot lamination for 3 mil or 5 mil and cold setting for self-adhesive pouches. Green light and audible beep indicate when machine is ready to laminate. Release lever disengages pouch for re-centering or removal. Auto shutoff saves energy and prevents overheating. Laminator includes a laminating starter kit. Part Number is FS3i125LPSK. I bought the laminator because as am an educator and make a lot of file folder games. This product is fantastic for that purpose, I highly recommend it! Have always had the best service with this company! All the qualities you need in a laminator: ability to use 8.5 x 11" and 11.5 x 17" pouches, tray in back to keep documents level until they are ejected by machine, quick cool-down, brilliant/durable final documents, and excellent price. I enjoy using the Fellowes Saturn 3i 125 Laminor with Pouch Starter Kit. It is just the right size for my needs. The 3 settings for thickness of the pouch are great. It heats up in good time. The copies come out smooth with no wrinkles. The pouches are clear and readable. I really enjoy my laminator and am thankful for the help that I received from the company. I will be purchasing future items. I will tell my colleagues about your company. Thank you for your help. USED SEVERAL TIMES FROM THE TIME WHEN PURCHASE AND HOLDING UP WELL. FELLOWES ARE GOOD PRODUCTS AND I HAVE USED IN THE PAST. I HAVE HAD SEVERAL FELLOWES SHREEDERS THAT HAVE HELD UP WELL OVER THE YEARS AND WHY I PURCHASED THE FELLOWES LAMINATOR. I have used it just once so far, but it heats up quickly and feeds great and straight. I plan on using it a lot more and will leave more feedback. Fellow's products are very good and worth purchasing. Amazon makes it easy and quick. I know I leave a lot of 5 stars, but I do my research first so it makes it easier when the item arrives. 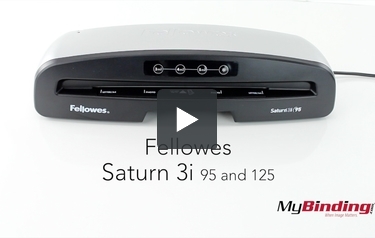 This is the Fellowes Saturn 3i 95 and 125! After you plug your machine in, turn it on. If you want, now you can place in the exit tray. Make sure it is down all the way, but this is not necessary, though. When the machine turns on, one of the buttons will flash and will turn solid when that setting is ready. The same happens when you push a different temperature. When laminating, first insert your project into your pouch—align for even margins on all sides. Then insert your pouch into the laminator sealed end first. It might take about a minute or so, but it will completely feed out the back—also notice that the catch tray is only useful for larger projects. If your project doesn’t get placed in straight, you can push the jam lever and remove the project. It may not save your project, but it could save your machine. If it jams completely the red light should turn on, though when I tried to jam it it still fed my page through and crunched it up pretty good. There are guides on the front to help you align your pages straight into the machine. Now, I have been demoing the 95 version. The 125 is the same thing, but bigger. So now you can laminate projects larger than your standard printer paper. Entry width - in 12.5" 9.5" 12.5" 9.5" 12.5" 9.5"
(inches p/min) 12" 12" 12" 12" 12" 12"
Dimensions 4.25" x 21" x 5.75" 4.25" x 17.25" x 5.50" 4.25" x 22.5" x 6.25" 4.25" x 17.75" x 5.75" 3" x 18.5" x 7" 3.06" x 14.5" x 7"
Thank you for your question, To address technical issues the best first step is to contact the manufacturers technical support department. The manufacturer is Fellowes and their phone number is 1-800-955-0959. If they are not able to assist, we are based out of Oregon, our service area is OR,WA, IL and southern CA. If you are in one of those areas contact us and we can set up a service call. If you are not in our service area we would refer you to a 3rd party nation wide service provider Serv Right, their phone # is 1-800-642-6015. Please let us know if you have any other questions or concerns. Thank you for your question. The Fellowes Saturn 3i 125 Laminator would be able to laminate a 11" x 17" sheet. It can accommodate laminate up to 12.5" wide.